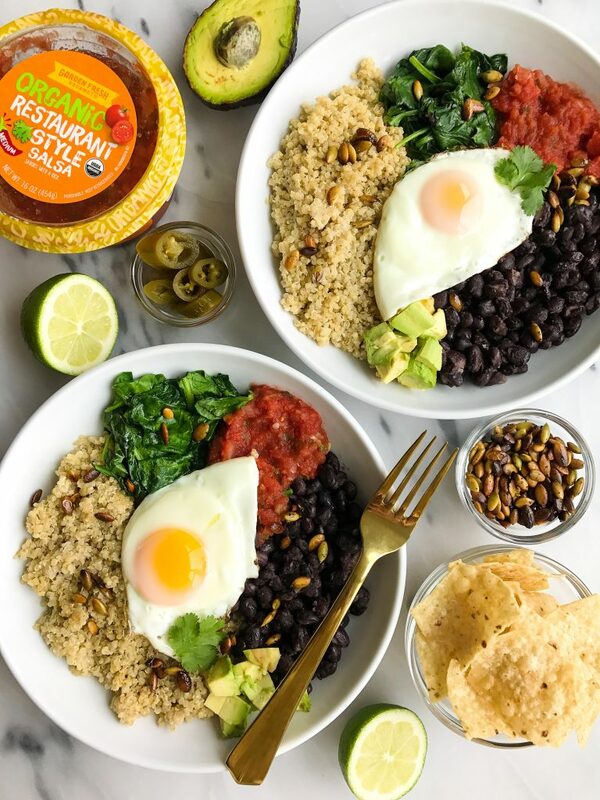 Vegetarian Taco Breakfast Bowls with Coconut Quinoa for a delicious savory breakfast recipe! I am all about the breakfast bowls right now friends. Well actually, I think we all know I am all about any meal that is in a bowl. Throw in a bunch of your favorite ingredients from your fridge, mix it up and you have yourself a solid meal. 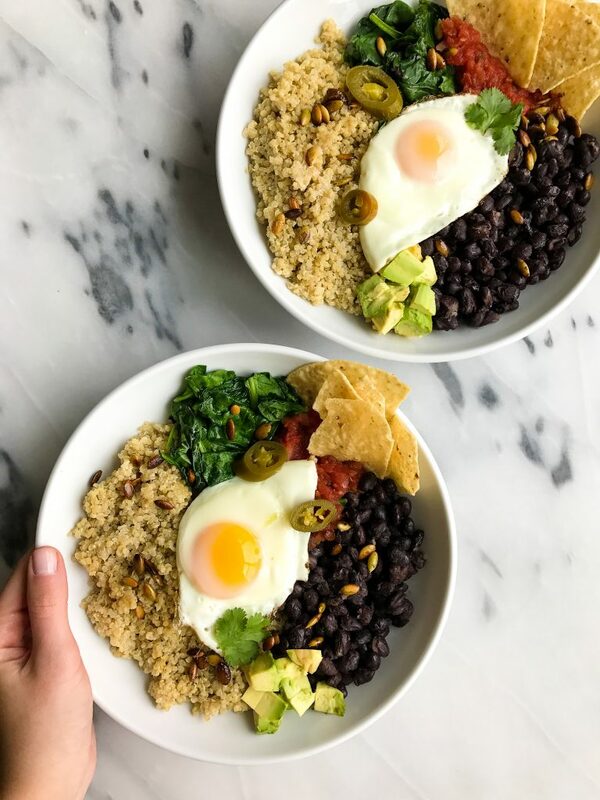 These Vegetarian Taco Breakfast Bowls with Coconut Quinoa are my new absolute favorite bowl meal that I cannot get enough of. I have had it the last 3 days because it is that good. Up until about a year ago, I was so not into eating fried eggs or anything that would allow the yolk to pour onto our food. Now, I can’t even tell you the last time I ate scrambled eggs or an omelette. Literally every time I eat eggs, I fry them up like this. Let’s go through this entire bowl though because it is made up of the dreamiest ingredients that are oh so perfect for your next family breakfast and especially for Cinco de Mayo! The based off this bowl is coconut quinoa, which may or may not be the only way I am eating quinoa from now on. I cooked it in coconut milk instead of water to get that creamy consistency and add more flavor. It is sooooo good like good enough to eat the quinoa by itself with no toppings good. 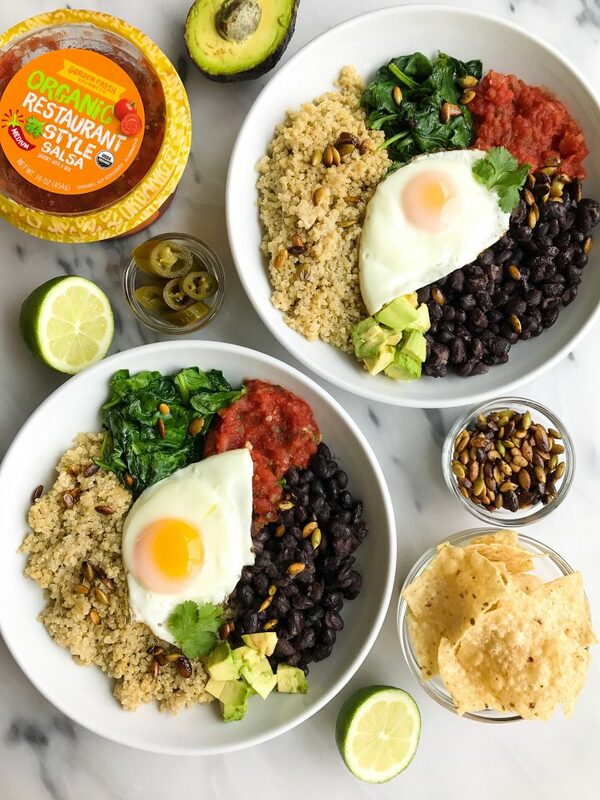 This breakfast taco bowl is SO easy to whip up for a family breakfast on weekends or if you are like me, anytime of the day. Breakfast food is my absolute favorite so I will gladly eat eggs all day everyday. Save this recipe for Cinco de Mayo, you are going to love. Cook the eggs to your liking and top off each bowl, sprinkle the cilantro and pumpkin seeds on top and enjoy! Thank you Garden Fresh Gourmet for sponsoring this post. It means so much to me to work with brands that I love and who support rachLmansfield! Oh man, these look amazing! As soon as I get home later in the week, I’m making these bowls! The coconut quinoa sounds so fun and I’m sure it has such a nice nutty flavor! And yesss! I love Garden Fresh salsa! It’s my FAVEe! I’ve never tried the organic one though, so that’ll be on my list to try! I never would have put quinoa and breakfast together, but this certainly looks delicious! This looks great! If I can have tacos around the clock and they are healthy then Im a happy man! Yum!! I’m tempted to wrap these into corn tortillas for on-the-go b-fast “burritos!” My husband (a non-breakfast-person) would even eat that! How do you cook your eggs- how long? I totally agree with you about eggs. I used to only eat them scrambled.